If you think you know everything there is to know about beer, you probably do! But you can always up your game. That's why we rounded up a collection of surprisingly simple beer hacks guaranteed to make the already-easy art of beer-drinking even easier and -- perchance -- make you look way smarter than you are. Never shall you have to wait for cold beer again. Or at least you won't have to wait more than two minutes. Or you can always open the beer bottle... with another beer bottle if you want to be real meta about it. 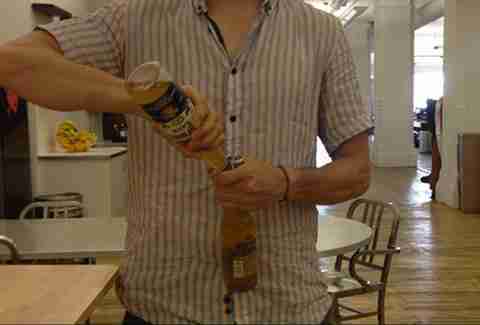 Watch a GIF of that hot beer-bottle-on-beer-bottle action, and we'll also teach you how to crack open a brew with a lighter, a book, and an iPhone charger. Oh, and a machete. I mean, why not!? Whether it's a can or a bottle, all it takes to chill a beer in two minutes is a bowl full of ice and salt, and the ability to stir the ice and salt. Then place the beer in the bowl. It's that simple. If you're not convinced, YouTube's DaveHax will prove it. You know how everyone canceled their cable bill when TV shows became easily accessible online? This will make you realize how worthless your fridge is. Throw that useless thing away and buy a bunch of ice and salt! But seriously, you can also use this trick when you need to make an Igloo cooler full of warm beers ice cold. Grab the bag of tools in your garage (specifically pliers, a screwdriver, and a wrench), and you'll be able to liberate the beer from its keg-shaped jail without the need of one of those silly taps. Granted, you'll get beer all over you first because you're spearing it with a screwdriver, but it's worth the work. Watch exactly how it's done. This is especially helpful if you find yourself in the woods with a keg and no tap, for some reason. In the unlikely event that you and your boozehound friends don't drink a pitcher fast enough to drain it of beer before it gets warm, simply drop a cup filled with ice inside said pitcher. It's a much better idea than dropping ice cubes in your beer, which is just disgusting. If you truly need to watch someone drop a cup of ice into a pitcher, Howdini has you covered. Don't just bite into a can willy-nilly before shotgunning it, unless you want to take a fun trip to the dentist office. You've gotta "wolf-bite" that sucker by chomping your "bottom right fang 3cm above bottom of can, pull to bottom of can, remove tooth from can, [and] use fingernail to slice aluminum into an acceptable 'gunning hole.'" We also teach you how to cheat at shotgunning. You've got until August when the tailgates start up again, so practice now with this handy guide. Don't let only having bottles of beer stop you from getting heaven's most beautiful liquid into your stomach as quickly as possible. Instead, grab a straw, throw it inside, bend it, and go to town on that sucker. We'll walk you through the steps if that didn't make things clear enough. 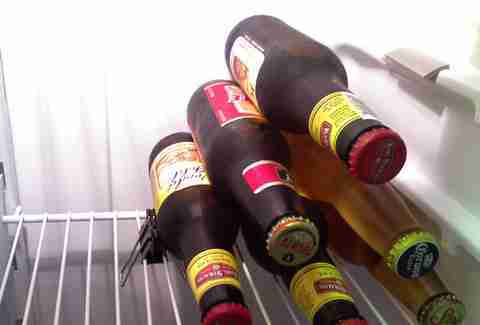 The good folks at Lifehacker unearthed this useful tip about how to cleverly keep beer bottles from sliding in your fridge. In fact, a commenter tipped them off to it, which proves that comments on the Internet are always useful and productive, and in fact make the world a better place. We're not saying you should smuggle beers into an outdoor concert or subway, but if you must, reduce your risk of getting shut down with this easy trick. 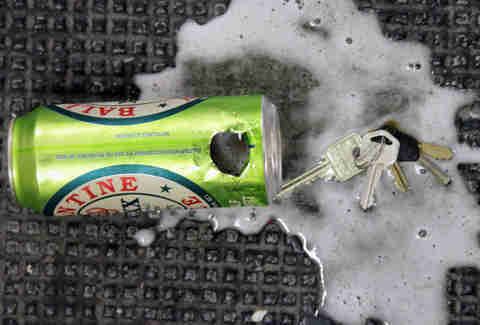 Using a can opener and some careful scissor skills, you can use a sleeve from a soda and place it over your beer can. Beer Mumbo can guide you through the process. It's like a koozie. A koozie full of delicious lies. 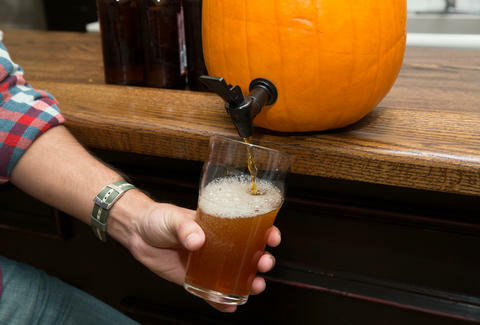 Once it's pumpkin season again, this is how to use Charlie Brown's favorite gourd as a vessel for beer. It'll only take 15 minutes and will probably be free, since you'll probably steal the pumpkin off of your neighbor's front porch. Despite it being tempting, do not attempt this on Billy Corgan's head. Lee Breslouer is a senior writer for Thrillist, and once opened a beer with his mind. Follow him to mind hacks: @LeeBreslouer.